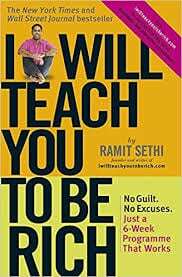 I Will Teach You to be Rich is a beginner’s personal finance book by Ramit Sethi. If you’re struggling focus on making more instead of saving. Samit recommends you set up a system that automatically allocate your money in the above format. Check the book for the details. Frugal is not the same as cheap. Frugal care about the value first, not just the cost. They think long term and are willing to spend for what they care about. Nobody can predict the market, says Ramit whom espouses the same theory which reminded me of A Random Walk Down Wall Street. Then, why not investing in index funds, which simply replicate the market? This is an idea similar to Unshakable and The Little Book of Common Sense Investing. The earlier you invest, the more you’ll able to take full advantage of the the compound interest (also read The Richest Man in Babylon). I Will Teach You To Be Rich suggests maxing out your 401(k) if you have an employer which matches your contribution. That makes a lot of sense of course. And then add some Roth IRA -another form of retirement plan which you can better control- and lifecycle funds, which shift in safer investment as you approach retirement. However, I have to add that Money Master the Game, the top investment book Tony Robbins wrote with people with the caliber of Ray Dalio, does not recommend 401k and target date funds. The title is misleading. To me teaching someone to be rich is teaching entrepreneurship or skills. Teaching how to manage money is more like accounting or money management. Read The Millionaire Fastlane to understand exactly what I mean. I find most of the personal finance books to be geared to people that either badly misspend or to people with a higher than average income. Otherwise, there’s just too little room to play with. Some of the investment recommendation run against what I have read -and agreed with- in other books. I love the automation idea. It saves not just money, but time. Which is also money, just better :). I felt particularly close to the idea of cutting mercilessly for all those things that don’t really improve your life. While spending for what you really love and makes your life worth living. If you’re really a beginner -and if you live in the US- I Will Teach You to Be Rich lays out a plan which you can follow step by step. That can be very useful if you fit the description. I Will Teach You to Be Rich is a good book for beginners on money management. In that respect, much similar to The Total Money Makeover. I’m glad these guys are out there to teach the basics to the first guys (those with easy credit card finger trigger). But if you’re not falling into both the first and second category, then the benefits are limited. I’m not a crazy spender myself, which makes the value of I Will Teach You to Be Rich more limited for me. I’m more after entrepreneurship and internet marketing than paying off debt. But if you’re still need to get your spending under control, then I Will Teach You to Be Rich can help.